What do you do when your life’s work is threatened? How far will you go to save it? 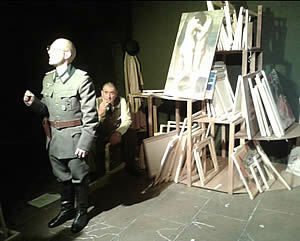 These are the questions facing Picasso in 1940 in occupied France in this new play by Ian Buckley. It’s based on an actual event when in September of that year he was visited by two young German officers in the vaults of the bank where he stored his work. 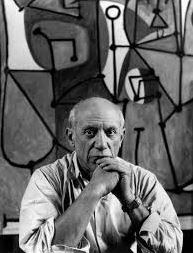 At that time Picasso was the most famous artist in the world, an exhibition in Munich in 1937 attracted more than two million people, but for the Germans his art was considered degenerate, likely to corrupt the Aryan spirit and weaken the Aryan race. His work was threatened. So what was Picasso thinking as he let the two Nazis into his vault to catalogue his work? This play is about is what Buckley imagines might have happened. As the two young officers rummage through his work, sneering at some of his finest pieces, Picasso hatches a plot to get them out of his hair and keep his precious artwork safe. He senses their weaknesses and plays on them. It’s a clever idea with a sharply written script brought to life with some stunning performances. Full marks to the three protagonists - Gary Heron as Picasso; David O’Connor as the bullying, but not as sure of himself as he makes out, Officer Franz Hebbel and Roberto Landi as the nervous Officer Willi Frisch, who appreciates Picasso’s work and even considers buying a piece. So as each shows his soft underbelly, Picasso works out his plot. Almost cruel at times, he manipulates them but it’s not just the two officers he’s manipulating, he takes in the audience as well. At first it seems we’re complicit in his scheme, but by the end we realise we’ve been duped as well because we have no idea whether he was lying or not. Overall I’d say it’s a thought provoking, imaginative and witty piece of work and well worth the trip to Comeragh Road. This the second of Buckley’s plays to be shown at this theatre. The first, The Tailor’s Last Stand, was put on last year and that was good. He says he aims to write one play a year and I hope he chooses to premier his next one here. 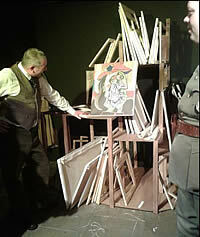 Picasso's Artful Occupation continues at Barons Court Theatre until March 30. Barons Court Theatre is at the Curtain's Up pub in Comeragh Road, W14 and tickets for all productions can be booked by calling 0208 932 4747 or by emailing londontheatre@gmail.comstating performance and number of tickets required. Pay in cash, when you come to the performance.